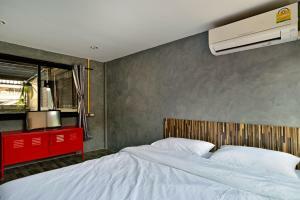 M Gray Hostel is situated in Bangkok, a short walk from Wongwian Yai BTS Skytrain Station and 2 km from Sapan Taksin Pier. 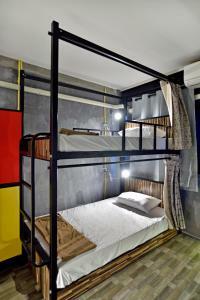 This stylish hostel features an air-conditioned shared lounge with a snack bar, and free WiFi is available in all areas. 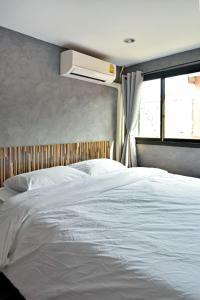 Both private and dormitory-style rooms are equipped with air conditioning. 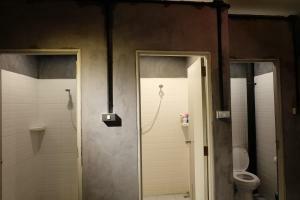 Guests have access to a shared bathroom with shower facilities. The private rooms are also fitted with a TV and a safety deposit box. At M Gray Hostel, guests can make use of a shared kitchen and luggage storage service. Designated smoking area is provided. The lively Khaosan Road and the majestic Grand Palace can be reached under 5 km from the accommodation, while shopping venues including Siam Paragon Mall and Central World can be accessed by the sky train. For meals, local dining outlets and convenience stores can all be found within 50 metres from M Gray Hostel. A security deposit is required upon arrival for incidentals as follows: - THB 300 for dormitory rooms. 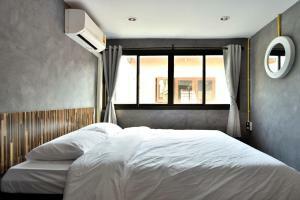 - THB 500 for Budget Double Room. This deposit is fully refundable upon check out and subject to a damage inspection of the accommodation. This female-only dormitory room features air conditioning as well as personal reading light and curtains. Guests of this room are provided with personal lockers and have an access to an external, shared bathroom. This room type can accommodate up to 8 guests. Rate is for 1 guest. A security deposit of THB 300 is required upon arrival for incidentals. This deposit is fully refundable upon check-out and subject to a damage inspection of the accommodation. Rate: THB 319.58 ... THB 896.00; select dates below to get current rates. 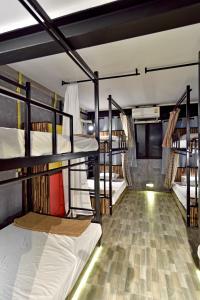 This dormitory room features air conditioning as well as personal reading light and curtains. Guests of this room are provided with personal lockers and have an access to an external, shared bathroom. This room type can accommodate up to 8 guests. Rate is for 1 guest. A security deposit of THB 300 is required upon arrival for incidentals. This deposit is fully refundable upon check-out and subject to a damage inspection of the accommodation. 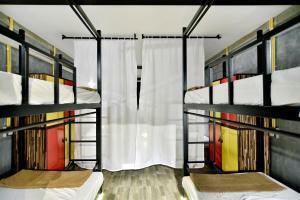 This dormitory room has air conditioning as well as personal reading light and curtains. Each bed is for 2 people. 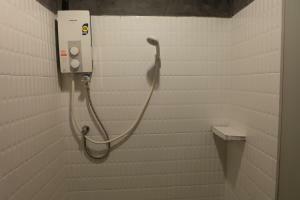 Guests are provided with personal lockers and have an access to an external, shared bathroom. A security deposit of THB 300 is required upon arrival for incidentals. This deposit is fully refundable upon check-out and subject to a damage inspection of the accommodation. This private double room has air conditioning and a TV. A security deposit of THB 500 is required upon arrival for incidentals. This deposit is fully refundable upon check-out and subject to a damage inspection of the accommodation.